Roland Prauss, European commercial director at Buehler ITW Test & Measurement GmbH. Buehler ITW Test & Measurement, a manufacturer of equipment, consumables and accessories for metallography and hardness testing, has combined its metallography and hardness testing business sectors. In Düsseldorf, the company is currently establishing a new, central laboratory in close cooperation with partners in industry, universities and research institutes, for handling international research projects covering everything from sample preparation in the laboratory right up to fully automatic in-process hardness testing. 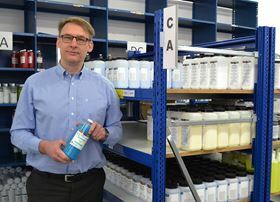 The facilities at the new 'Buehler Solutions Centre' in Esslingen, Germany, offer more space for development, training, production, sales and warehousing. ‘The physical consolidation of our metallography and hardness testing operations at a single site will produce synergistic effects, which will enable us to respond to the future demands of a Europe-wide market,’ said European commercial director Roland Prauss. This story uses material from Buehler, with editorial changes made by Materials Today. The views expressed in this article do not necessarily represent those of Elsevier. Nacre, or mother-of-pearl, is a natural material with hard and soft components that attains high stiffness, strength, and fracture toughness.